If you are traveling to the Philippines from an international destination, you will have to fly into Manila. Connecting cities include Incheon, Korea; Narita, Japan; Hong Kong; or Taipei, Taiwan. Incheon International Airport is always a nice airport to connect through, as it offers many amenities like a sleeping lounge, playgrounds, tons of bathrooms, and free showers — they even provide the towels, soap and shampoo. Many people spend the night in Manila before boarding another domestic flight to El Nido or Puerto Princesa. But if you can time your flights right, it’s possible to go straight from the Manila Ninoy Aquino International Airport to Air Swift (formerly known as ITI )and fly directly to El Nido. How do I get from the Manila Ninoy Aquino International Airport to my hotel? 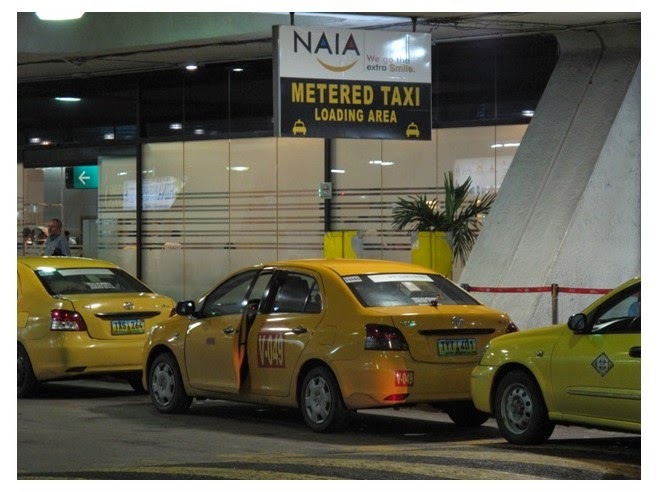 Once you exit the baggage claim at Ninoy Aquino, you will be able to take two types of taxis. The first is a metered yellow taxi and the second is a white taxi. Please note that white taxis, while plentiful, are not officially recommended by the airport and usually do not use meters. If your taxi driver shows you a price card instead of using a meter, do not get in the taxi. It is likely that you are being overcharged as a tourist as it is a rampant problem. Please be sure to read more tips on riding taxis on this page here. In the city of Manila, taxis with a meter usually have a rectangular decal attached to the right part of their front window that say they are meter certified. These are often white taxis unlike the airport. If you see a meter decal, ask the driver if they will turn on the meter before getting in, or you may find yourself hopping out of a lot of taxis! Be sure to have lots of small bills for taxis as some drivers will say they don’t have change. Once in a taxi at the airport, you can opt to pay an extra 20 pesos to take the Skyway, which is well worth it to avoid the heavy traffic into downtown Manila. Many travelers stay in the Makati City area, which in good traffic is about 20-30 minutes from the airport. Metered yellow taxi fares to and from the airport should be around Php 200-300. Makati City is the financial center of Manila and has plenty of hotels, restaurants and shopping malls, all within walking distance.